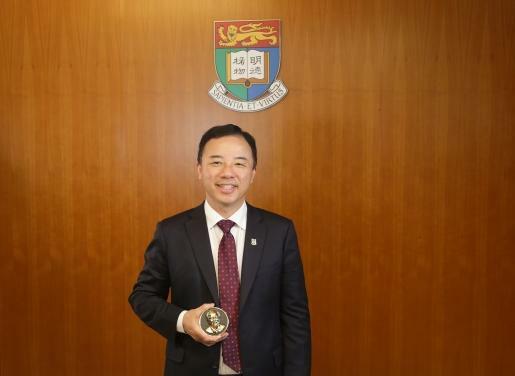 Professor Xiang Zhang, President and Vice-Chancellor of the University of Hong Kong (HKU), was awarded the 2017 A.C. Eringen Medal from the Society of Engineering Science (SES) in recognition of his contribution in micro-nano scale engineering for microelectronics and photonics. The Eringen Medal is the highest award from SES, awarded annually to an individual in recognition of sustained outstanding achievements in Engineering Science. Former awardees include five Nobel Laureates. Professor Zhang received the award at the 55th edition of the Annual Technical Meeting of the Society of Engineering Science, which took place on October 10-12, 2018 at the campus of the Carlos III University of Madrid in Spain. An Eringen Medal Symposium was held in his honour on the occasion. "I am very much honored to have received such a prestigious award. I am deeply indebted to my students and collaborators whom I was fortunate to work with on these exciting scientific innovations". Professor Xiang Zhang is a world renowned scholar pioneering in optical science and material physics. Professor Zhang's research was selected by Time Magazine as one of the "Top Ten Scientific Discoveries of the Year" in 2008. Professor Zhang is an elected member of the US National Academy of Engineering (NAE), of Academia Sinica, and of the Chinese Academy of Sciences. Prior to joining HKU, he was the inaugural Ernest S. Kuh Endowed Chair Professor at the University of California, Berkeley, and the Director of the Nano-scale Science and Engineering Center (SINAM). He has also served as the Director of Materials Science Division at Lawrence Berkeley National Laboratory (LBNL).